Bounder harbor launch ramp is where we check in and out, start and finish the tournament and do the wt ins. 8-8:30 am Check IN that your teams is ready to go and receive any last minute instructions. One person per team can do this. 9-3:00 Diving is allowed in the lower basin only. Do not enter the water until 9:00 GPS – phone time. Captains must play safety for there divers. 3:00 Unloaded guns must be out of the water. Pick up your divers quickly after that. 3-3:30 Travel time to be in the same buoy line as departing. 1 second late disqualifies your team, for the day. DON’T BE LATE! 3-6 Weigh in at the top of the boat ramp by the bathroom. Stay with your fish and keep them cool and wet. You will pick your biggest fish each day, and sign that your fish were counted correctly. Upon signing there is no recourse on your score. 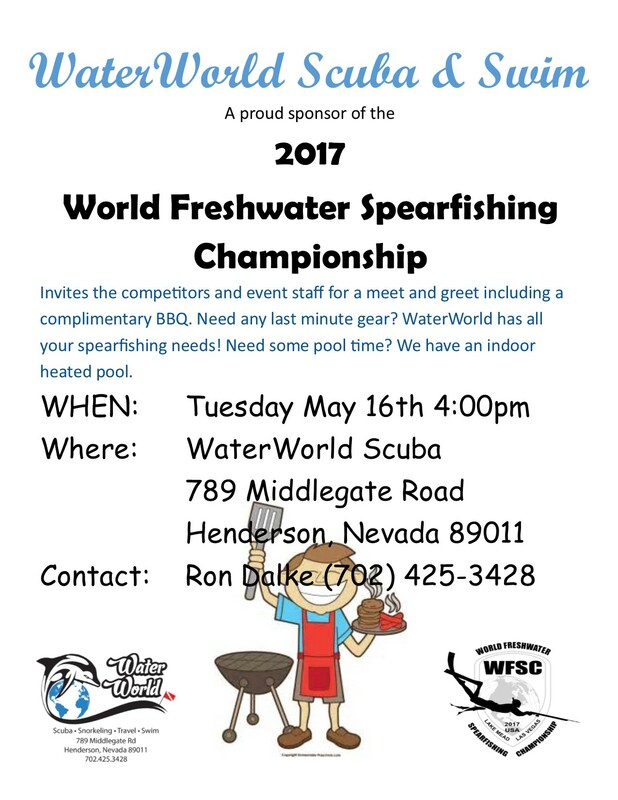 Scores will be posted there and on the web site for late viewing, Drinks and snacks will be available for divers and WFSC support. After speaking to our local Dept Of Wildlife Warden, he asked that I review a few rules that should be made clear before you all get to Lake Mead and start scouting. All these will be on the web site and reviewed again at the Briefing May 15th, 6pm, Railroad Pass Casino. There is a state rule that you can not dive with in 1/2 mile of a harbor or swim beach. That is equal to 880 yds or 805 meters. So please be aware of this and just stay away from the 2 marinas. Also there is a long swim beach area between the Boulder Harbor boat ramp (our staging area) and to the right – East to the LV Boat Harbor. This full length of beach is off limits for diving, it is also not that productive , so less area to scout. There are a couple small bathroom floating docks, you may dive around them. Fishermen on shore and in boats anchored have the right to be there first and fish their zone. Please give them a wide birth and surface swim beyond their fishing zone before you start diving again. Being friendly to these fishermen is always a good idea to keep the peace. Boats trolling where your hunting: Your dive Flag should be respected by other boats but few recognizes them so keep your eyes open for on coming traffic in both directions. Try to make a friendly pass by, if boats need to troll past you. Just getting out of their way for a 1 minute, it can avoid a lot of tension. House boats hang out in lots of the coves and need to be avoided as well. giving a 200 foot space keeps everyone happy. The northern boundary for the event is a NO WATER SKING buoy line just 2 miles north of Callville Harbor – bay. This is where the lake narrows to only 70 mt wide. It is also very steep & deep diving and not very fishy. If you wish to practice spearfishing travel north of these narrows into the shallow parts of the northern lake area. Diving around other competitors is fair game but not productive, give each other some space. When picking up your divers, Captains should avoid other divers by 100 ft . Always approach slowly and carefully when all divers are on the surface. All divers need to drag a red and white divers flag on a line not more then 100ft away, with them, everywhere . All dive boats should also carry a divers flag to help other boats identify that divers are in the area. Captains of boats should be close enough to their divers for safety and to support them, while giving them enough room to focus on the competition. 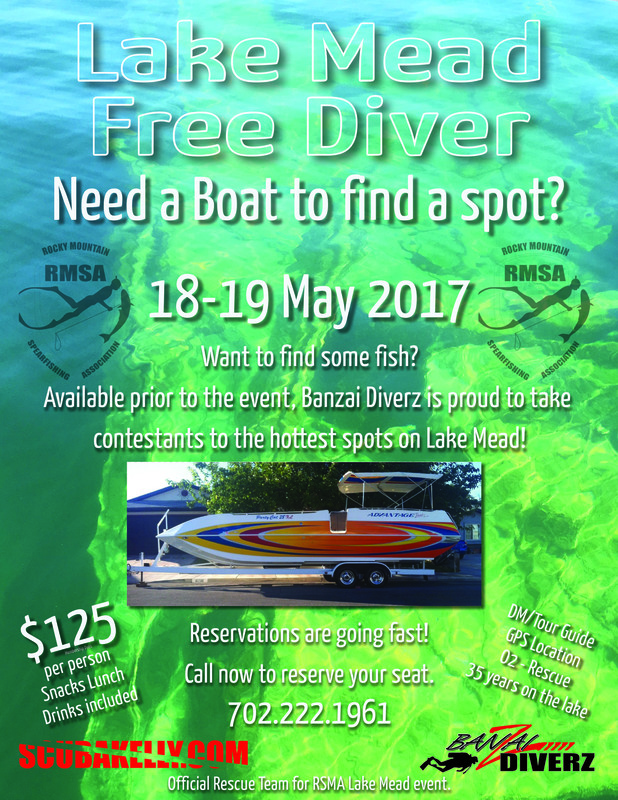 There needs to be at least 2 competitive divers on each boat. All fish need to be shot the day of the meet and be kept in separate containers with ICE. Only Carp will be counted on May19th, 1 point per fish. Your 1 biggest fish will be weighted each day and the biggest one will break any scores that are ties. You must pick this fish at or before the wt table. You may use a scale on your boat or while your in line. **A tie will happen in this event , so it is important to pick your biggest fish each day no matter how small you think they may be. There is no spearfishing in the event region 30 days before the event. However guns with out shafts and pole spears with out heads or bungees may be dove with. Black bass (large and small mouth) are not allowed to be shot. Razor back chubs are endangered and not allowed to be shot. We are Grateful to have Water World as a sponsoring local dive shop. Please contact Ron Dalke to reserve your lead for free. They will also have back up dive gear, flags, tag lines, stringers, guns, and souvenir shirts. As a back up only, use these locals to help you with FREE loaner lead. Bring your own wt belts. Email your request to the correct person.